Our Website, Online Courses, Books & Resources! 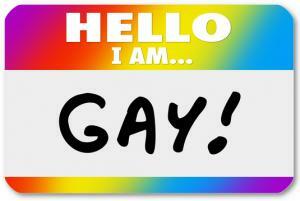 Are You About to Come Out to Your Christian Parents? If so, this is a Must Read. Coming out to your Christian parents can be a real risk. You put everything on the line, and you don’t know what will happen. Will they come alongside you? Or disown you? I’m a Christian mom of five kids. My oldest daughter came out about 8 years ago and soon after, my youngest daughter came out. We embraced them immediately, but many parents don’t. I just filmed a video for The Advocate magazine that is specifically for people who are about to come out to their conservative Christian parents. You can view that video here. I wanted to write to you today to give you some important advice: hope for the best… and prepare for the worst—because honestly, you may not know ahead of time which way it will go. It’s like watching for a tropical storm on the horizon—it may just blow by you and go out to sea—or it may turn into a Cat 5 hurricane that will destroy everything in its path! Or anywhere in-between. The more hurricanes you’ve seen—either on the news or for real—the more you realize what a risk they can be. Please don’t think I’m insensitive, comparing someone’s coming out story to hurricanes like Harvey or Irma. Really. Those events caused real and lasting destruction and death. The last thing I want to do is offend those terrorized by such events. I am using that analogy to point out that a family’s response can be like a hurricane to the one it hits. LGBTQI people have lost their families and communities; they’ve been made homeless, their personal belongings thrown away or burned on the lawn. If it happens to you, it is a personal hurricane. I’m here to give you a heads-up about talking to your parents. If you do come out, have a plan of what you’ll do if it turns bad. Have someone on-call or have someone with you. Or go to a public place. Over the years, I’ve helped a lot of young people to come out to their parents, and here’s how some of them do it. One guy came out to his mom at a coffeeshop, and he held onto the keys because he was afraid she might take off. One woman put campus security on speed-dial before she came out to her parents in her dorm room. One teen was so used to his parents’ volatile abuse, yelling and throwing the Bible at him—that his grandmother went with him to tell his parents. They did go ballistic, so his grandmother took him to live with her right then and there… and they grabbed the bag he had ready. What would you put in that bag? Anything you’d want to have if you suddenly were displaced. Your devices. Any paperwork that would be hard to replace—like birth certificate, drivers license, social security card, passport if you have one. And cash. I don’t want to scare you! Just better safe than sorry. Better to laugh about having a bag you don’t need, than to cry about needing a bag you don’t have! It can be hard to tell if your parents will lose it completely. But the best indicator of future behavior is past behavior. After a devastating hurricane, FEMA surveys the area and determines “no-build zones.” In some cities, the same areas are devastated by multiple hurricanes. How many times does it take to stop building on areas that have been repeatedly devastated? If your parents have a history of flying off the handle, of telling you about God’s will and God’s wrath, they’ll probably do that again. Consider carefully before you say something you can’t unsay. Take it instead as an indication that you should be ready to evacuate if the storm comes. Hope for the best… prepare for the worst. I talk to a lot of parents—and when they realize their kids were afraid to tell them—and took steps to protect themselves—it breaks their heart. They didn’t even know that rejecting your child was a thing. Of course, LGBTQI people have seen the devastation—they’ve seen the damage of hurricanes, so to speak—as their friends have found themselves homeless, or beaten up, or cut off from everything. Just the fact that their child had to think about preparing for a bad outcome, is sobering to parents! They may be devastated that you carried this around, alone, for so long. Here’s what you can do for them: tell them you’re all good, all is well, they didn’t cause this, and they don’t need to regret anything—but that you do need them to love you and to be there for you now. 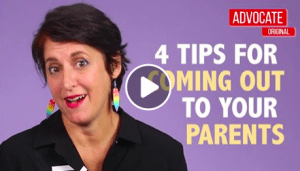 I also filmed a video for The Advocate just for parents. If you want to share this video with them, you can find it here. On the other hand, they may not be ready to talk, and you may have to wait. That’s fair. Tony said, “Yes, and in just a moment I’m going to find out if you’re worthy to be her father.” You see? Because that dad’s response reveals him, not her. Hope for the best… and prepare for the worst. I don’t know what your mom or dad will say, but I will tell you what this mom says. You are worthy. You belong. You matter. You deserve to love and to be loved—as you are, for who you are. That’s the truth. 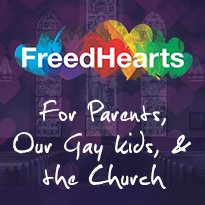 We have ‘pay-what-you-can’ video courses helping LGBTQI heal shame from family, church & community wounds; helping parents love, accept & affirm their LGBTQI children while strengthening their faith; and helping those in the faith community gain a vision for lavish, Christlike inclusion. We also have private Facebook support groups for parents, and other resources. Please click here. 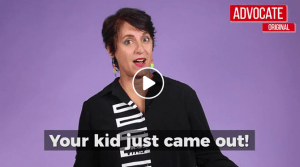 ← Did Your Child Just Come Out to You? If so, this is a Must Read! Enter your email address to follow Susan & FreedHearts and receive notifications of new posts by email.